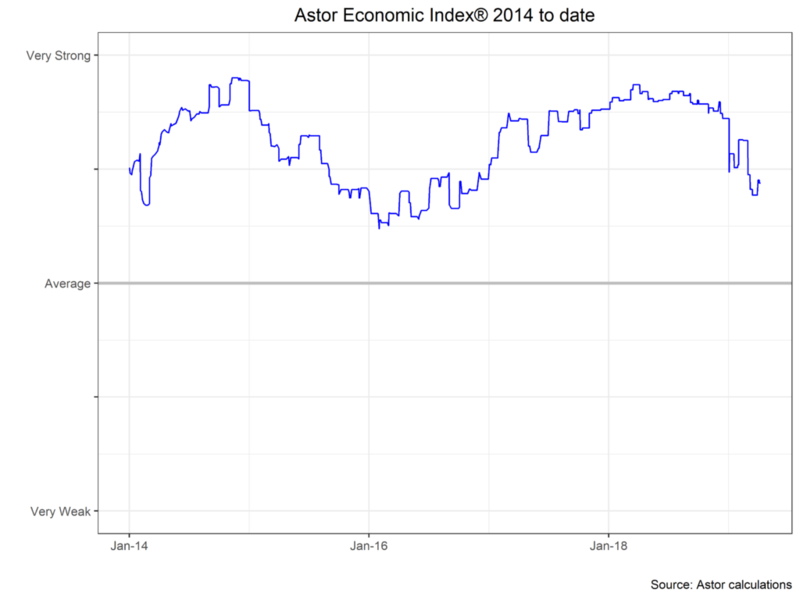 Our proprietary Astor Economic Index® is still showing above average growth in the U.S. economy. The index recovered somewhat in line with the more positive payroll report released last week. The payroll numbers in March rebounded from February’s low number which is now looking like an aberration and not the beginning of a downturn. Despite the good news about the aggregate level of jobs, the level of jobs growth may be slowing slightly. 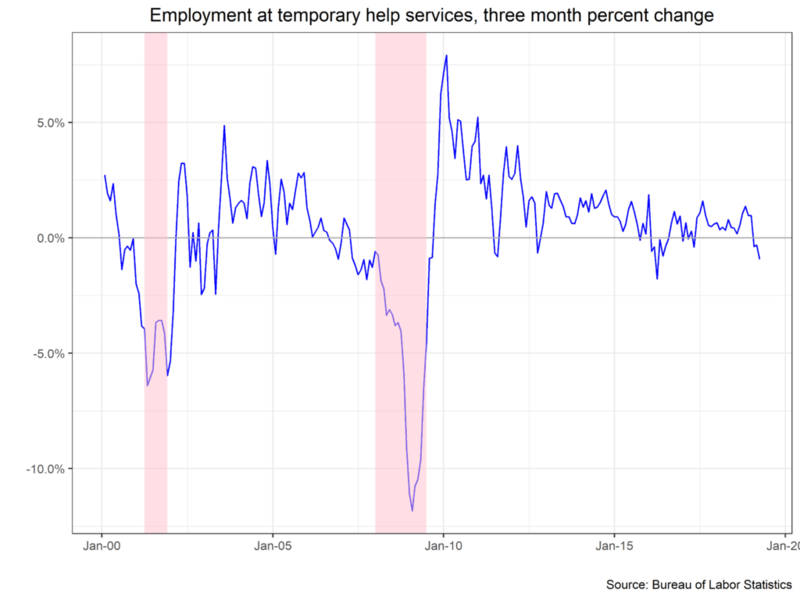 University of Oregon’s Tim Duy points out that hiring temporary help services has been slowing. At times this can presage a recession, but it also can be consistent with a milder slowdown in growth, as shown in the chart below around the 2016 energy and manufacturing slowdown, which of course did not turn into a broad recession. While I am alert for signs of weakness, another important early warning system, New Claims for Unemployment Insurance, is still giving a positive reading and of course as noted above the overall pace of job growth remains solid. After December’s hike in the midst of market turmoil, Fed officials calmed the market in January with a series of speeches and comments focusing on their ability to be patient. March’s meeting of the Fed’s Open Market Committee showed that this was not a short-term reaction. Looking at the statement of economic projections, a majority of the members of the FOMC no longer see any rate hikes in 2019. Additionally in his press conference, Jerome Powell said that the Fed has had a problem getting inflation above its 2% target. I theory this is a symmetric target, but from the outside it looks more like a limit: The Fed has started raising rates well before inflation gets to the 2% area. Overall, I still see U.S. economic growth as positive but only slightly above average. The domestic labor market continues to expand while overseas weakness is a headwind. For still more charts you can see our collection of economic charts or download the Astor Economic Research App from the App Store. As always, we at Astor will be monitoring the economy closely to inform our investment decisions.